The intensity of light that propagates through glass optical fiber is fundamentally limited by the glass itself. 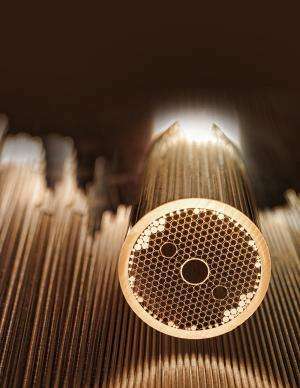 A novel fiber design using a hollow, air-filled core removes this limitation and dramatically improves performance by forcing light to travel through channels of air, instead of the glass around it. DARPA's unique spider-web-like, hollow-core fiber, design is the first to demonstrate single-spatial-mode, low-loss and polarization control—key properties needed for advanced military applications such as high-precision fiber optic gyroscopes for inertial navigation. Although hollow-core fiber has been available from overseas suppliers for years, DARPA's ongoing Compact Ultra-Stable Gyro for Absolute Reference (COUGAR) program has brought design and production capacity inside the United States and developed it to a level that exceeds the state of the art.